This page lists the best muscle building foods that you should consider adding to your grocery list. 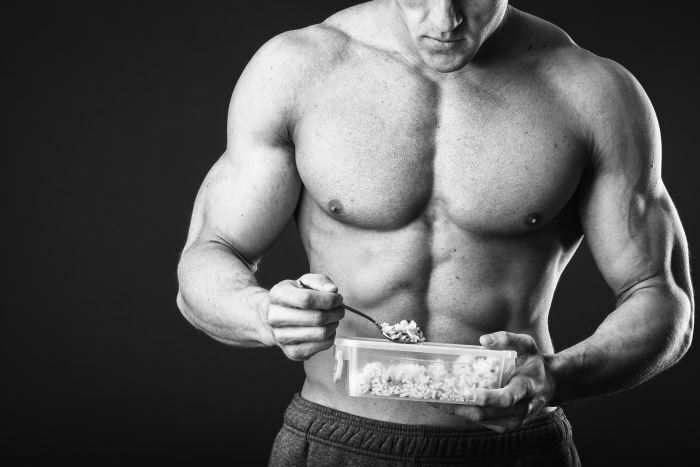 You will discover the best food sources for each macronutrient (protein, carbohydrates, and fats) that will help you build a diverse muscle building diet plan. Yes, it is possible to get strong and gain muscle mass by eating nutritious and (relatively) delicious foods! The Diet Plan “Big Picture.” Even if you’re eating all of the muscle building foods listed on this page, you will not gain muscle mass or reach strength goals without a proper bodybuilding diet plan. That is, you must be eating the right amount of protein and total calories; not just certain types of food. Overlap. It’s important to note that, by nature, there is overlap between food sources and macronutrients. That is to say, most foods contain more than one macronutrient. For example, some types of fish are a great source of protein as well as dietary fat. Protein. Protein, and specifically amino acids, are the building blocks of muscle tissue. Foods with high protein content include the broad dietary groups of meat, fish, and dairy products. If your diet is calorie restricted, I recommend eating the lower fat versions (e.g., leaner meats, skim milk, egg whites, etc.) of these foods. However, if your diet requires a boatload of calories, then the higher fat (calorically dense) versions might be more appropriate for you. Meats. Meat is the champion of all protein-rich, muscle building foods. One serving of meat contains all the essential amino acids. Specifically, red meats are also superior sources of iron and Vitamin B12. Fish. Although they tend to be more expensive, fish is a very healthy muscle building food choice. Fish tend to be either very lean or very fatty. The fatty fish double as a plentiful source of protein as well as a healthy source of fat. Fatty fish contain plenty of protein and a healthy serving of the essential omega-3 fatty acids. Dairy. I’d have to say that dairy is probably my favorite of all food groups, which may have something to do with growing up on a farm for the first ten years of my life. Unfortunately, there is a common broscience myth floating around the web that dairy “makes you fat,” which has no solid data to back it up. However, you may want to limit your intake if you have some degree of lactose intolerance. Below is a list of the top muscle building dairy products. Carbs. Carbs are protein sparing. Your body uses them as an energy source to get you through the day, through your workout, and to recover from your workout. Foods with carbohydrates can be broken down into three categories: simple, starchy, and fibrous carbs. As a general rule of thumb, the more fiber content in these products the better; usually a higher fiber content will lead to a higher protein content as well because of the type of unrefined grains used. Simple Carbs (Fruits). Simple carbs are the most basic form of carbohydrates. They provide quick energy and replenish liver glycogen. Unfortunately, simple carbs have gotten a bad rap because people associate them with candy and junk food. In actuality, simple carbs are found in one of mother nature’s most nutritious types of food – fruits. Starchy Carbs. Starchy carbs are classified as “complex” because they take longer to digest than simple carbs, and thus, provide sustained energy.These carbs should typically make up the bulk of your carbohydrate intake. Fibrous Carbs (Vegetables). Fibrous carbohydrates are characterized by my personal arch nemesis – vegetables. As much as I loathe veggies, they provide essential vitamins, minerals, and, of course, lots of fiber. Nearly any vegetable will suffice, but you should keep in mind that the greener the veggie is, the more power-packed it is with nutritious goodies. Dietary Fat. Muscle building foods with dietary fat are broken down into two major categories: unsaturated and saturated fats. Although both are necessary, you should consume more unsaturated than saturated fat. Unsaturated Fats. This category of fats is further broken down into polyunsaturated and monounsaturated fats. Unsaturated fats help to lower high levels of blood cholesterol and are a necessary part of any muscle building diet. Saturated Fats. A moderate amount of saturated fat has been shown to increase testosterone levels, which increase your ability to build muscle mass. But be careful – too much can increase your blood cholesterol levels over time. Thank you for the great info. I learned a lot. Great list of muscle building foods. Knew some of them already, but prepared a whole new list after reading this post. Hope to see more articles like these on your website. Cheers! Thanks for sharing the info agreed with you and need help to cut off my bulky belly. You’re welcome, Rohan. Good luck with your fat loss. What kind of help you need? You’re welcome. Thanks for reading, Mahendra.